The rainforests of eastern Madagascar are shrinking due to population growth, poverty-driven land degradation and widespread ignorance of ecological dynamics. This has resulted in large-scale transformation and fragmentation of these forests, threatening their unique biodiversity. Many of these problems are also manifest in and around the village of Andasibe. Based on the example of Association Mitsinjo, and drawing from more than a decade of experience of community-based natural resource management in Andasibe, we highlight the challenges and successes of a community-run conservation organization that builds trust through a holistic approach resting on five building blocks: (i) management transfer of natural resources to the local community, (ii) community-based nature tourism, (iii) training of para-scientists, (iv) rainforest restoration and improving local livelihoods, and (v) environmental education. This has resulted in the creation and legal protection of two community-run reserves, Analamazaotra and Torotorofotsy, accompanied by ecological monitoring programs. We illustrate how handing over responsibilities to local communities can be a promising approach to conserving natural resources and biodiversity in Madagascar and elsewhere. La superficie des forêts tropicales de l’est de Madagascar diminue avec la croissance démographique, la dégradation des terres par effet de la pauvreté, ainsi que par l'ignorance générale des interrelations écologiques. Tout cela a abouti à une transformation profonde et étendue ainsi qu’à la fragmentation de ces forêts qui menacent leur biodiversité. Ces problèmes globaux sont pour la plupart rencontrés à la périphérie du village d'Andasibe. Ici, l’exemple de l'Association Mitsinjo est présenté avec plus d’une décennie d’expérience en gestion communautaire des ressources naturelles à Andasibe. Sont ainsi exposés les défis et les succès d'une organisation de conservation gérée par la communauté qui gagne la confiance à travers une approche posée sur cinq piliers : (i) le transfert de gestion des ressources naturelles à la communauté locale, (ii) l’écotourisme à base communautaire, (iii) la formation de para-scientifiques, (iv) la restauration de la forêt tropicale humide en augmentant les moyens de subsistance des gens vivant sur la périphérie, et (v) l’éducation environnementale. Les actions entreprises ont abouti à la création et la protection efficace de deux réserves gérées par la communauté, accompagnées de programmes de surveillance écologique. Grâce à la responsabilisation des collectivités locales dans la protection de la biodiversité, elles montrent une fierté des actions entreprises qui est un indice prometteur pour la conservation des ressources naturelles et de la biodiversité à Madagascar et ailleurs. ANGAP. 1995. Liste des plantes d’Andasibe. Association Nationale pour la Gestion des Aires Protégées. Unpubl. Report. Ballet, J., Rakotohariniaina, B., Ramaroalison, S., Randrianalijaona, M. & Tolizara, C. 2011. Vulnérabilité économique des populations et vulnérabilité des ressources forestières: le cas d’Andasibe. In: Vulnérabilité, Insécurité Alimentaire et Environnement à Madagascar. J. Ballet & M. Randrianalijaona (eds. ), pp. 159–190. Editions L’Harmattan, Paris. Cliquennois, N. 2007. Aperçu général de la diversité des phasmes de Madagascar (Insecta, Phasmatodea). Le bulletin d’Arthropoda 32: 3–16. Coutinho, J. B. 2007. Livelihoods, Conservation and Ethical Trade: A Baseline Study of Forest Margin Communities in the Commune of Andasibe, Eastern Madagascar. Unpubl. M.Sc. Thesis. School of the Environment and Natural Resources, University of Wales, Bangor. Dolch, R. 2008. Sustainable natural resource management. The case of the Analamazaotra Forest Station, Andasibe, Madagascar. Monografie del Museo Regionale di Scienze Naturali di Torino 45: 377–384. Dolch, R. 2012. Species composition and relative sighting frequency of carnivores in the Analamazaotra rainforest, eastern Madagascar. Small Carnivore Conservation 44: 44–47. Dolch, R., Ratolojanahary, T., Randrianasolo, H., Rasolofoharivelo, T., King, T. and Randrianarimanana, L. 2013. Torotorofotsy–Ihofa. In: Lemurs of Madagascar: A Strategy for Their Conservation 2013–2016. C. Schwitzer, R. A. Mittermeier, N. Davies, S. Johnson, J. Ratsimbazafy, J. Razafindramanana, et al. (eds. ), pp 71–73. IUCN/SSC Primate Specialist Group, Bristol Conservation and Science Foundation, Conservation International, Bristol, UK. Dolch, R., Fiely, J. L., Ndriamiary, J. N., Rafalimandimby, J., Randriamampionona, R., Engberg, S. E. and Louis Jr., E. E. 2008. Confirmation of the greater bamboo lemur, Prolemur simus, north of the Torotorofotsy wetlands, eastern Madagascar. Lemur News 13: 14–17. Dransfield, J. and Beentje, H. 1995. The Palms of Madagascar. Royal Botanic Gardens, Kew and The International Palm Society, Surrey, UK. Edmonds, D., Rakotoarisoa, J. C., Dolch, R., Pramuk, J., Gagliardo, R., et al. 2012. Building capacity to implement conservation breeding programs for frogs in Madagascar: Results from year one of Mitsinjo’s amphibian husbandry research and captive breeding facility. Amphibian and Reptile Conservation 5, 3: 57–69. Glaw, F. and Vences. M. 2007. A Field Guide to the Amphibians and Reptiles of Madagascar. Frosch-Verlag, Köln, Germany. Hockley, N. J. and Andriamarovololona, M. M. 2007. The economics of community forest management in Madagascar: is there a free lunch? USAID, Washington, D.C. accessed 29 March 2015. Hume D. 2006. Swidden agriculture and conservation in eastern Madagascar – stakeholder perspectives and cultural belief systems. Conservation and Society 4: 287–303. Janssen, T. and Rakotondrainibe, F. 2008. A revision of the indusiate scaly tree ferns (Cyatheaceae, Cyathea subgen. Alsophila sect. Alsophila) in Madagascar, the Comoros and the Seychelles. Adansonia 30, 2: 221–376. King, T., Ravaloharimanitra, M., Randrianarimanana, H. L., Rasolofoharivelo, M. T. and Chamberlan, C. 2013. Community-based conservation of critically endangered lemurs at the Sakalava and Ranomainty sites within the Ankeniheny-Zahamena rainforest corridor, eastern Madagascar. Lemur News 17: 63–70. Martin, N., Shoch, D., Dushku, A., Pearson, T. and Grimland. S. 2004. Measurement and Monitoring Plan for the Mantadia-Andasibe Corridor Restoration and Conservation Carbon Project, Madagascar. Unpubl. Report. Winrock International Report to CELB of Conservation International, Arlington, VA, USA. Paiva, A. and Randrianarisoa, J. 2010. Partnership structures and project management in two reforestation initiatives: Emas, Brazil and TAMS, Madagascar. In: What is Needed to Make REDD+ Work on the Ground? Lessons Learned from Pilot Forest Carbon Initiatives. C. A. Harvey, O. Zerbock, S. Papageorgiou and A. Parra (eds.) p 32. Conservation International, Arlington, VA, USA. Pawliczek, M. and Mehta, H. 2008. Ecotourism in Madagascar: How a sleeping beauty is finally awakening. In: Responsible Tourism – Critical Issues for Conservation and Development. A. Spenceley (ed. ), pp 41–68. Earthscan, London. Pollini, J. 2012. Understanding agricultural intensification on a forest frontier in Madagascar: elements for a Malthusian/Boserupian synthesis. In: Contested Agronomy: The Politics of Agricultural Research in a Changing World. J. Sumberg and J. Thompson (eds. ), pp 116–130, Earthscan, Oxford. Pollini, J., Hockley, N., Muttenzer, F. D., Ramamonjisoa, B. S. 2014. The transfer of natural resource management rights to local communities. 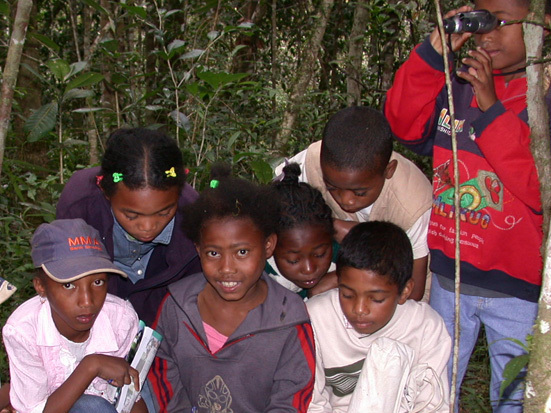 In: Conservation and Environmental Management in Madagascar. I. R. Scales (ed. ), pp 172–192, Routledge, New York. Randrianarimanana, L., Ravaloharimanitra, M., Ratolojanahary, T., Rafalimandimby, J., Rasolofoharivelo, T., et al.. 2012. Statut et conservation de Prolemur simus dans les sites de Ranomainty et Sakalava du Corridor Ankeniheny-Zahamena. Lemur News 16: 2–7. Salafsky, N. and Wollenberg, E. 2000. Linking livelihoods and conservation: A conceptual framework and scale for assessing the integration of human needs and biodiversity. World Development 28, 8: 1421–1438. Toillier, A., Lardon, S. and Herve, D. 2009. An environmental governance support tool: community-based forest management contracts (Madagascar). International Journal of Sustainable Development 11: 187–205. Wallach, V. and Glaw, F. 2009. A new mid-altitude rainforest species of Typhlops (Serpentes: Typhlopidae) from Madagascar with notes on the taxonomic status of T. boettgeri Boulenger, T. microcephalus Werner, and T. capensis Rendahl. Zootaxa 2294: 23–38. Woodhead, C., Vences, M., Vieites, D., Gamboni, I., Fisher, B. L. and Griffiths, R. A. 2007. Specialist or generalist? Feeding ecology of the Malagasy poison frog Mantella aurantiaca. The Herpetological Journal 17, 4: 225–236.